This is what it could mean for our future. For decades, scientists have theorized about what lies beyond the third dimension and if there can exist a unified theory to explain all of the workings of the universe. This insurmountable task has been taken on by many over the last century or so. But it was not until the emergence of superstring theory, or string theory, that an answer seemed possible. String theory exists in an attempt to join the ideas of Einstein’s general theory of relativity with quantum mechanics, put together to apply quantum theory to gravity. In a 2005 TED talk, theoretical physicist Brian Greene explains this theoretical principle by breaking down our knowledge of matter. He explains how everything is made up of atoms, which are made up of electrons, protons, and neutrons, which can be broken down further into quarks. Up until string theory, that is where our knowledge ended. But string theory suggests that making up this seemingly indivisible subatomic particle are what appear to be strings, whose vibrating and ever-changing shapes and interactions through space make up all that we know. There were many theories that led to the initial development of string theory in 1968. Beginning in the early 1900’s with the unified theory, many have sought to expand the knowledge of our known universe. But currently, while it is not yet within our grasp to prove string theory through experimentation, theoretical physicists like Edward Witten continue to explore the theory’s’ possibilities. Witten, in an interview with NOVA, describes string theory as such. String theory is an attempt at a deeper description of nature by thinking of an elementary particle not as a little point but as a little loop of vibrating string. One of the basic things about a string is that it can vibrate in many different shapes or forms, which gives music its beauty. If we listen to a tuning fork, it sounds harsh to the human ear. And that’s because you hear a pure tone rather than the higher overtones that you get from a piano or violin that give music its richness and beauty…Unity of the different forces and particles is achieved because they all come from different kinds of vibrations of the same basic string. In the case of string theory, with our present understanding, there would be nothing more basic than the string. 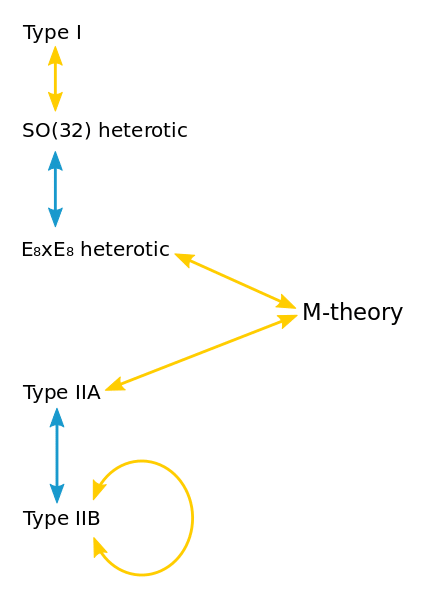 Edward Witten has made massive contributions to physics throughout his life, including his introduction of M-theory, a theory that unifies all 5 current variations on string theory (The 5 variations being type I, type IIA, type IIB, SO(32) heterotic, and E8xE8 heterotic). In the 1990s, it was thought that these 5 types were separate and only one of them could be valid (whichever theory’s energy limitations matched the physics on earth). Witten has theorized that there are dualities which can connect the multiple theories through particle interactions. There are some who see string theory as an interesting aside, nothing more than a fascinating possibility. But the possibilities that lie in furthering research into string theory hold much more than just a captivating story. When the theory of gravity was first discovered by Sir Issac Newton, it was an incredible revelation; but it was just that. While it was revolutionary, the immediate practical applications were nothing even close to what they are today. From Newton to Einstein’s general theory of relativity to the current 10-dimensional Brans-Dicke theory of gravity, this ever changing theory has allowed scientists to continue to innovate, invent, and make progress. Without this advancement and knowledge, flight, space exploration, and even modern medicine would not exist as we know them to be. Similarly with string theory, if the boundaries of theoretical physics continue to be pushed, then it will be possible to one day use such invaluable information to once again mold our scientific viewpoints. And while M-theory is not yet a proven absolute answer for a unified equation, it has so far given scientists invaluable insight into 2- and 5-dimensional objects, and the ability to understand the dualities that unify and connect our current understanding of string theory.